In the 2014-15 Canada West regular season, only the University of British Columbia were able to score three goals against the Manitoba Bisons on more than one occasion. For that fact, the Bisons would have been nervous in facing the UBC Thunderbirds in a three-game series. However, as goalie Rachel Dyck and company would prove, nervousness was the last emotion they were experiencing. Both teams beat each other at home this season, splitting the season series 2-2 and indicating that the playoff meeting would be a tight affair. The University of British Columbia hosted the playoff series, having accumulated the better regular season record. Although, it was Manitoba who clinched the semifinals 2-1, in which all matchups last weekend finished with a 2-1 score. Heading into the series, the Bisons lost Lindsay Blight to a lower body injury in game one hosting Regina. The veteran defender was taken out behind her own net and remained down, until medical staff removed her from the ice as she avoided placing any weight on her right foot. Coach Jon Rempel commented that the injury was a big loss for the team, and called upon rookie Megan Tully to fill the void. British Columbia used their home ice advantage to establish early leverage on the Bisons in game one, where the Thunderbirds led 2-0 after the two periods. Dyck was able to hold back the Thunderbirds’ onslaught and stopped 21 of 23 shots, giving a chance for league scoring leader and rookie of the year Alanna Sharman to cut the lead to 2-1. 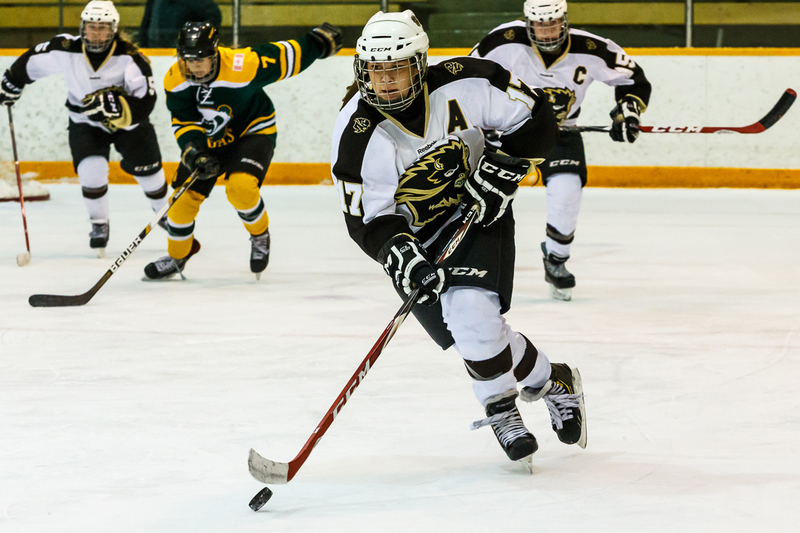 Captain Maggie Litchfield-Medd assisted on the lone Manitoba goal, recording her fourth point in four playoff games. Despite their best efforts, the Bisons dropped the opening match 2-1. Game two was an all-or-nothing for Rempel and his young Bisons. The Thunderbirds outshot Manitoba 11-5 in the first period of the game, but Dyck stood tall in the scoreless period. Both teams exchanged goals in the second period, both scoring on the power play. As regulation time came to a close, the Bisons knew each play would be more important than their last. The next goal wouldd be the most crucial in their season to date. Manitoba was no stranger to overtime in the playoffs. Their final two games of the quarter-final series against Regina were concluded after regulation time, where Courtlyn Oswald clinched the opening series for Manitoba in game three. This time around, it was Alexandra Anderson who played the role of overtime hero in game two against the Thunderbirds, scoring in double overtime. The Bisons’ season was extended for at least one more game. Winning at UBC for the first time this season gave the Bisons momentum heading into game three, and Rempel’s side never let up. Having lost game two with Samantha Langford, UBC turned back to goalie Danielle Dube for the matchup, as she was the starter in the Thunderbirds’ game one win. The Bisons’ top line of Alana Serhan, Alanna Sharman, and Maggie Litchfield-Medd came through despite UBC’s goaltender’s plans, scoring in the first and third periods. Dyck had arguably her best performance of the Canada West playoffs, stopping 23 of 24 shots and only conceding a goal midway through the third period. The final horn came as relief to the Bisons, who began to succumb to late one-on-one battles in the Thunderbirds’ bid for a 2-2 score. The game three victory by a 2-1 score marks the second time in this playoff campaign that the Bisons have closed out a series by one goal. This could be a determining factor as Manitoba now faces top-seeded Alberta in the Canada West finals. The Pandas have the conference’s top offence and defence, scoring three goals per games and conceding 1.25. Manitoba split the regular season series 2-2 with the Pandas, winning one game in Alberta and one at home. The series also featured stellar goaltending, in which Dyck recorded a shutout when Alberta visited Manitoba late in November 2014. 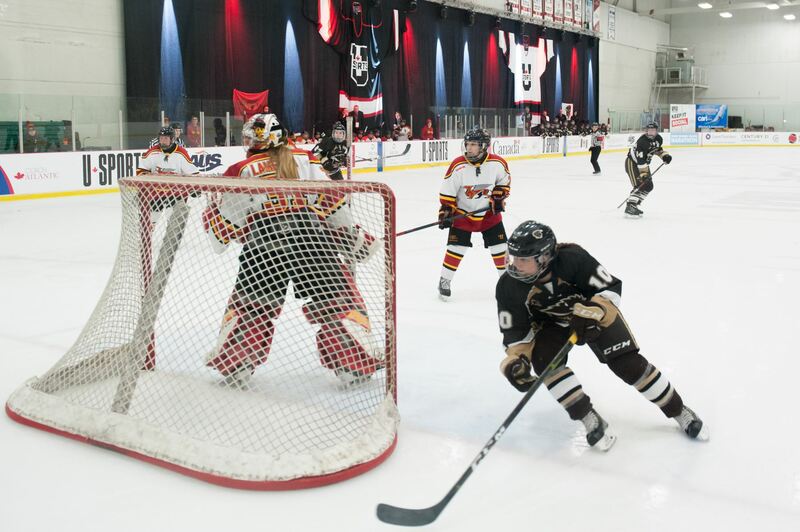 Her opposition Lindsey Post also notched a shutout when the Bisons travelled to Alberta earlier that month. Post’s shutout marked the only time this season that any team has kept the Bisons’ high-powered offence from scoring in a game. Despite facing a higher ranked team for the second time in three playoff rounds, this young crop of talent is sure to deliver yet another high energy and entertaining performance, as has been on display for most of this season.